What makes Paris so special is the quality of the ingredients they use, from a Michelin star restaurant to a sandwich stand. Nobody here settles for the cheap way out. A simple sandwich: fresh baguette, Iberico ham, and a generous slathering of raclette cheese. Three ingredients, one incredible sandwich. Almost didn’t get one. My daughter turned to me and said: “Dad, if you keep looking at it, you’re just going to torture yourself more. “ After all, what was the point of going to Paris if I wasn’t going to eat everything? Not a bit of guilt. Not before and not after! My daughter’s continuing quest to go to every Hard Rock Cafe possible. So far: Orlando, New York, Cayman Islands, Washington DC…and today: Paris! 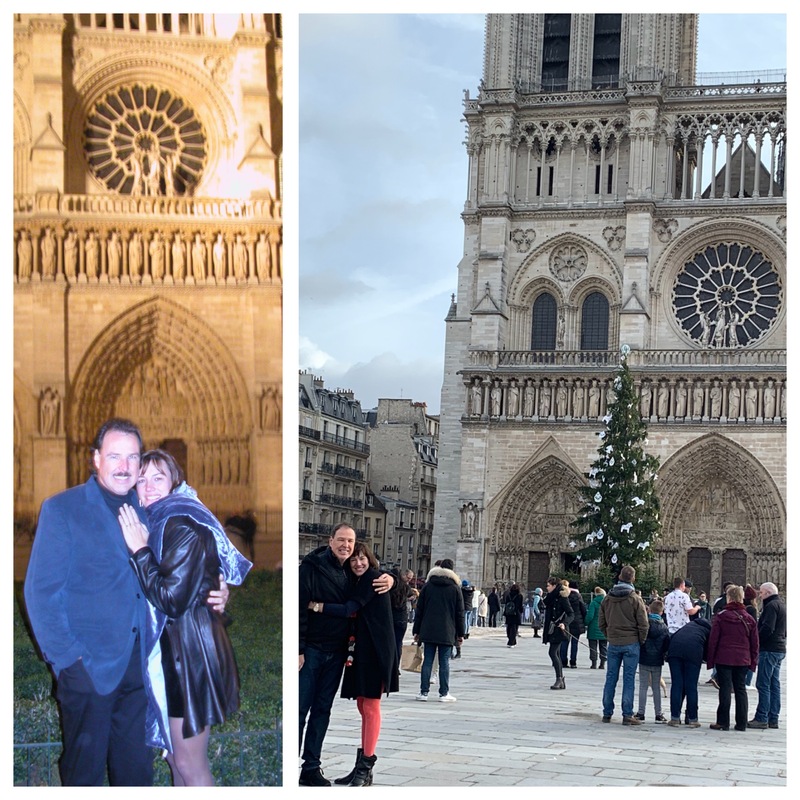 Sixteen years ago, on the one-year anniversary of our first date, I flew her to Paris and proposed in front of the Cathedral of Notre Dame. Now, we’re back, with our daughter taking the photo. 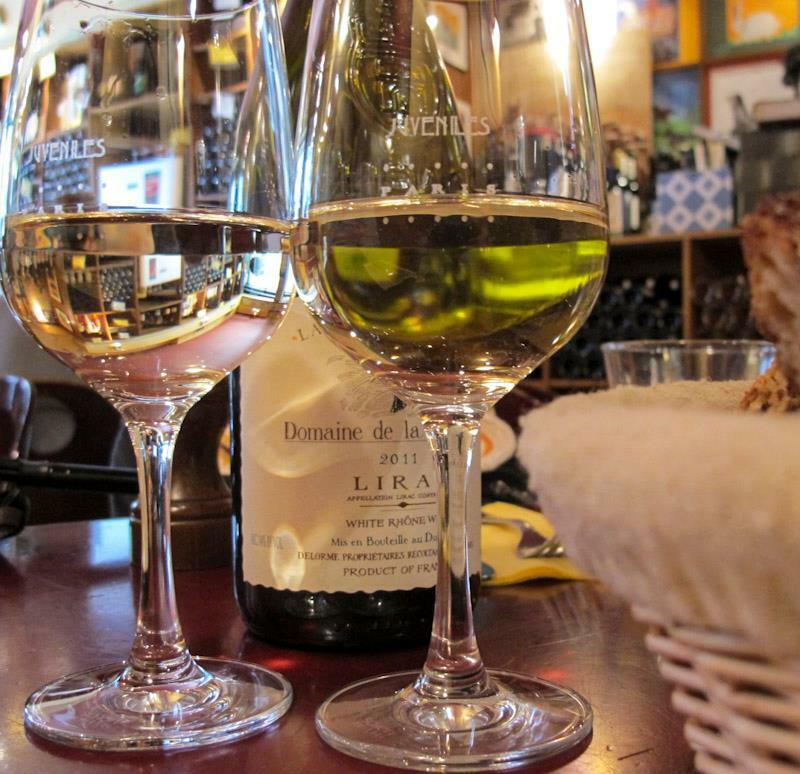 Visiting Paris again, we had to stop at our favorite wine bar, Juvéniles. Sadly, our friend, Tim Johnston, went home to England at the same time we arrived. Nonetheless, his daughter, Margeaux and her husband, and accomplished chef, treated us well. Dinner included foie gras, sautéed mushrooms, fresh scallops from Brittany, guinea hen, and more! It seems silly to travel all the way to Paris for a jar of mustard, but that’s exactly what we used to do. 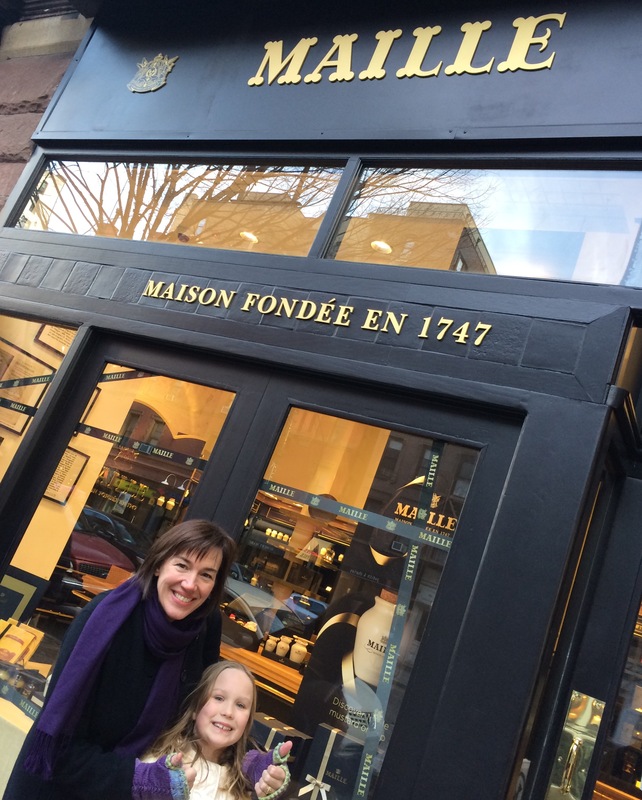 OK…we happened to be in Paris when we made the pilgrimage to the Maille mustard shop, but I couldn’t imagine a trip to the city of light without making the stop. 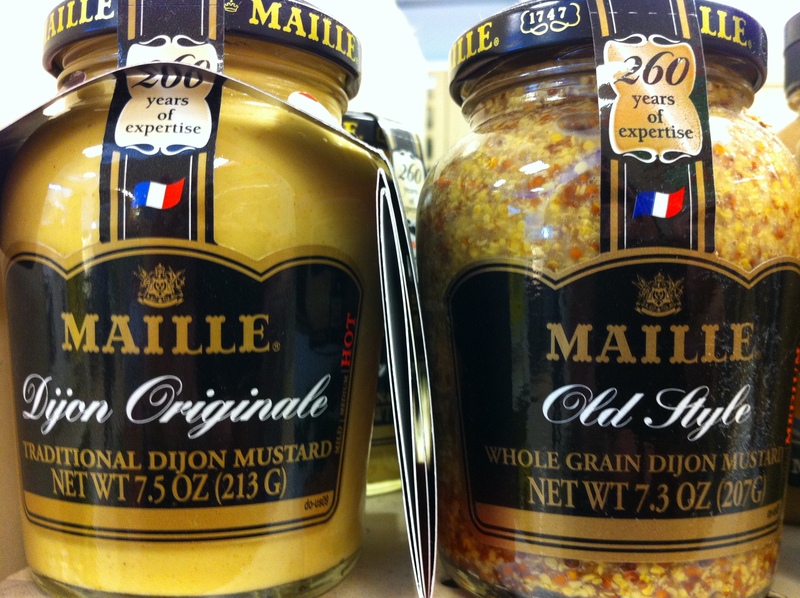 Back in 1747, Antoine Maille was known by many as the greatest mustard and vinegar maker of all time. He created the now-famous Maille Dijon Originale mustard in Dijon, France, and opened a shop in Paris to sell it. To this day, the company follows his strict guidelines to re-create that magic. 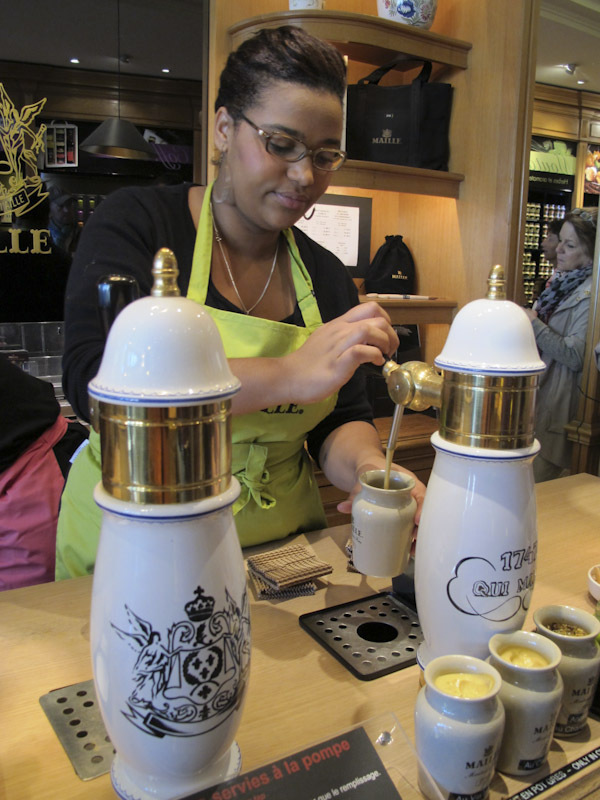 The Maille company opened a second store, in Dijon, in 1845. Saving us thousands of dollars in travel expenses, there are now 2 Maille mustard shops in my home town of New York City. 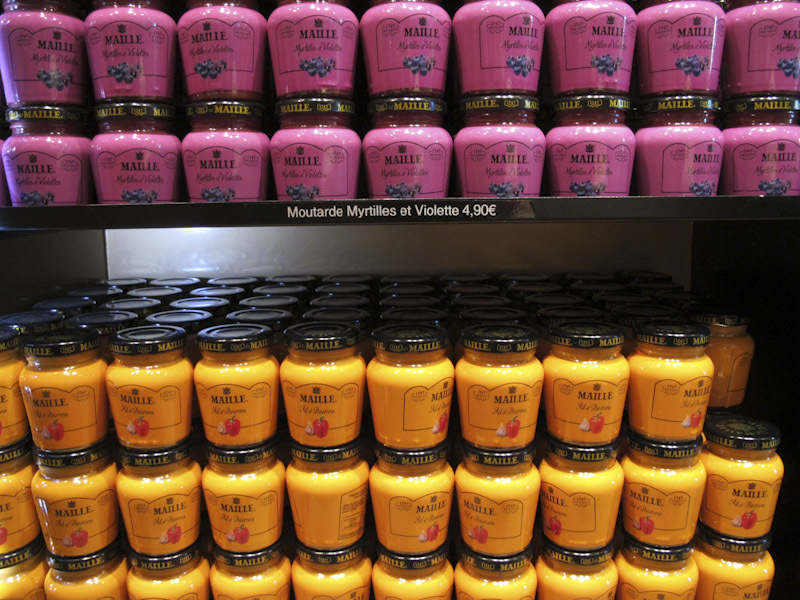 When you visit the Maille Paris shop on place de la Madeleine, you’re surrounded by beautiful displays of colorful jars of mustard. But you need to focus on the mustard taps–yes, like beer taps–at the main counter, a long oak bar where fresh mustard (no preservatives, never more than 10 days old) is dispensed into ceramic jars that are filled, corked, and wrapped in tissue paper. Our mustard of choice is the Maille Chablis mustard, which is unlike anything I’ve ever been able to find here in the States. And though it is potent, it has a magical quality that I can’t even begin to describe. How do I get one of these taps in my home? While you’re standing in line for your mustard–and there is always a line–you can sample the three fresh mustards offered with a pretzel or a cracker. Aside from the Chablis mustard, there is also a grape juice and honey mustard, and a white wine mustard. In the old days it was a sad day indeed when I opened the last jar of Maille mustard, look deep down inside, and saw that there was nothing left…just a dry residue of crusty mustard. I’d have to wait until our next trip to Paris. Now, it’s an excuse to go home to New York City and stock up! It seems silly to travel all the way to Paris for a jar of mustard, but that’s exactly what we do. 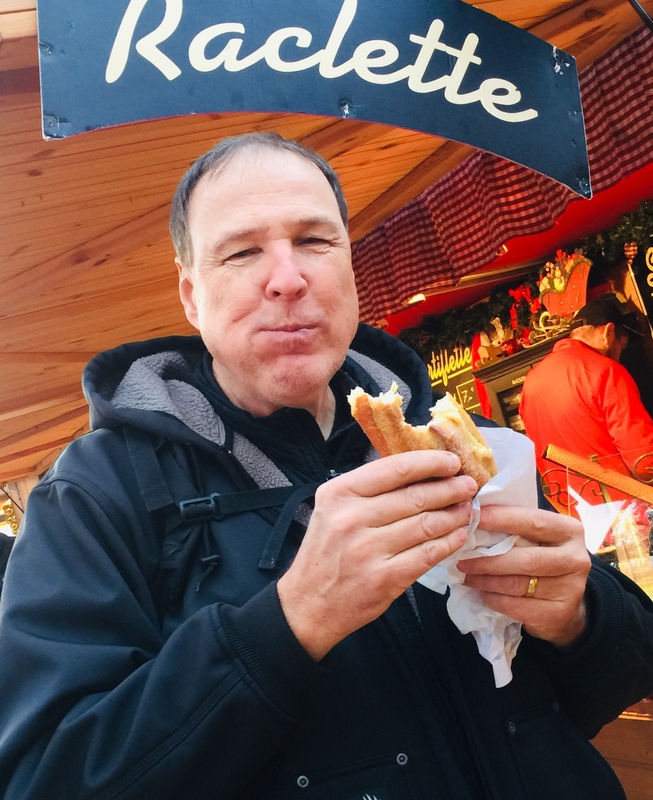 OK…we happen to be in Paris when we make the pilgrimage to the Maille mustard shop, but I couldn’t imagine a trip to the city of light without making the stop. There are several varieties of Maille mustard available in most supermarkets here in the United States, but the one mustard you can’t get…is the one you really want! Our mustard of choice is the Mailles Chablis mustard, which is unlike anything I’ve ever been able to find here in the States. And though it is potent, it has a magical quality that I can’t even begin to describe. Despite the fact that they say the potency of the fresh Maille mustard doesn’t last more than a few months, it doesn’t stop my wife and me from buying enough to keep us happy until the next trip to Paris a few years later. The way I look at it, the less potent Chablis mustard is still better than anything I can find on a store shelf here at home. It is a sad day indeed when I open the last jar of Maille mustard, look deep down inside, and see that there is nothing left…just a dry residue of crusty mustard. I put the jar down, and go directly to my computer to book the next possible trip to Paris! 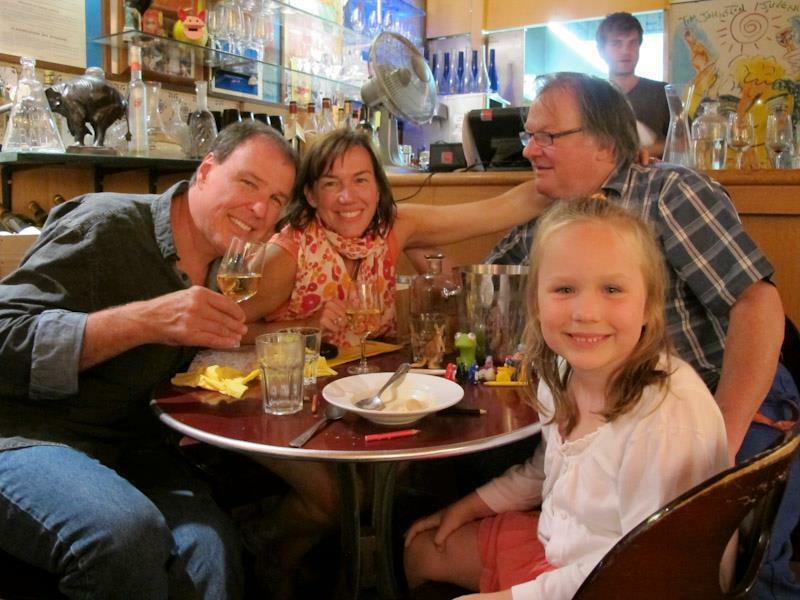 Paris has a special place in the hearts of my wife, myself, and even my 5-year-old daughter. It’s where my wife and I got engaged back in 2002. It’s where we celebrated my wife’s 40th birthday with family and friends in 2005. And it’s where my daughter has ridden on seven—count ‘em—seven—carousels…a record I’m sure she’ll want to break on her next trip. One of the reasons why Paris is so special to us is a small, unpretentious wine bar called Juvenile’s, at 47 Rue de Richelieu. The owner is Tim Johnston, a sharp-tongued wise-cracking Scotsman who happens to know a helluva lot about wine and spirits, and is in fact a consulting editor to Saveur magazine. Tim takes no BS from his clients, and that adds to the entertainment value of every visit. My wife met Tim back in 2001, just a few months before she had met me, when she and her Mom took a trip to France. The friendship with Tim was forged, and it has been going strong ever since. Tim, in typical fashion, tolerates me because he enjoys the company of my lovely wife…and I can’t say that I blame him! The food at Juvenile’s is rustic…nothing fancy here. But it is all very good and satisfying. 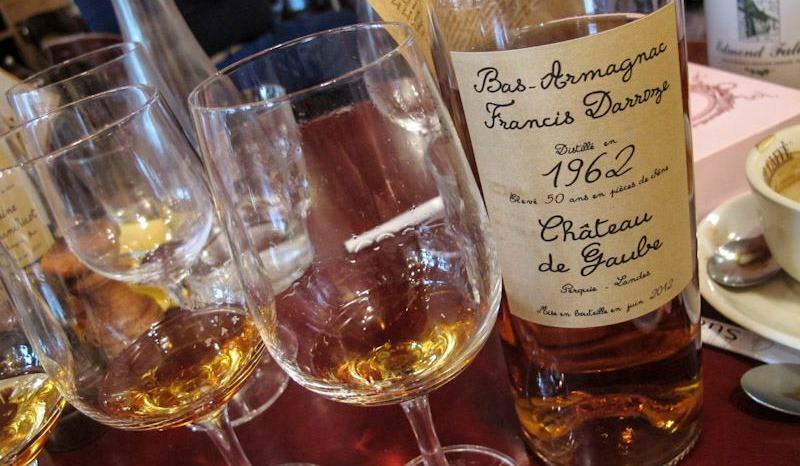 We’ve found what we consider the best foie gras in Paris here. The potatoes with raclette and bacon are fantastic. Sausage dishes, duck dishes…all the favorites, all wonderfully prepared in a very, very small kitchen in this wine bar that holds, perhaps, 30 people. 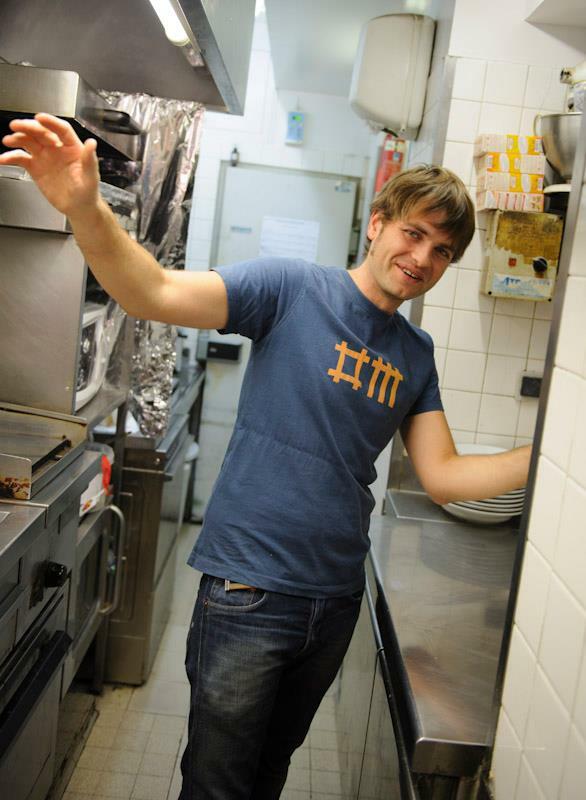 Paolo, Tim’s right-hand man, working the tiny kitchen at Juvenile’s. Juvenile’s is one of Paris’ original wine bars, serving wine by the glass way before everyone else thought it was cool to do so. And even the locals will come in on a regular basis to ask Tim what the latest great wines are. The man has earned the respect of those who know. 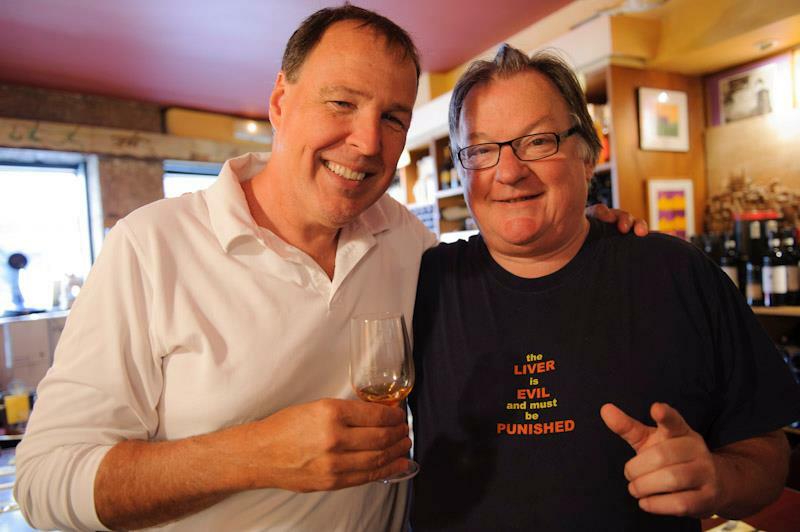 We make Juvenile’s a mandatory stop with every visit to Paris we make, lingering sometimes for an entire day…eating, chatting, and sampling wine and even fine cognacs that Tim is willing to share with us. Often, we come back for a second and even third visit during the same trip. It’s a great place to unwind and get away from the hectic pace of the day, whether you’re a tourist or a local. The next time you’re in Paris, stop by Juvenile’s and tell Tim I sent you. He will promptly throw you out! Tim and me. Great t-shirt!